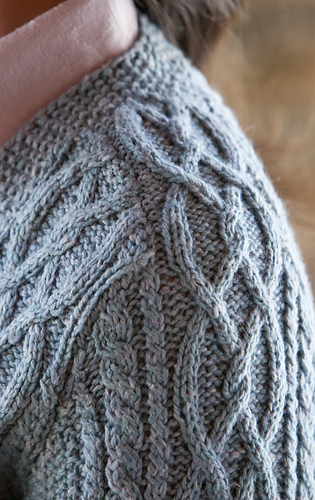 in seed stitch on larger needles. About 31 (35½, 40, 43, 47½, 50½)" (78.5 [90, 101.5, 109, 120.5, 128.5] cm) bust circumference; designed for a close 꼀t with zero ease. Sweater shown measures 35½" (90 cm). 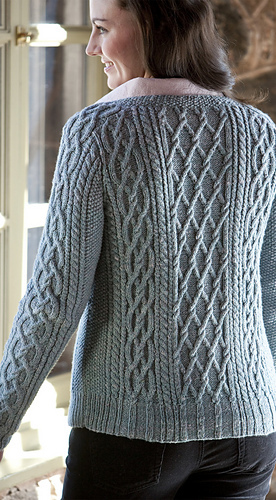 Cabled Aran sweaters—named for the islands off the coast of Ireland where they are believed to have originated—are ubiquitous, but surprisingly recent additions to knitwear history. They became widespread in the early 1900s when women of the islands began to knit garments to supplement sparse household income; patterns became commercially available in the 1940s. of the many myths surrounding these sweaters, one of the most widespread is that a fisherman drowned at sea could be identified by the unique pattern of his sweater. 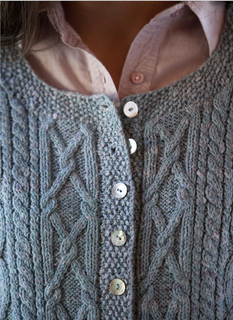 What is established fact is that as knitting trends change and evolve, Aran sweaters continue to be hugely popular. This sweater, while heavily inspired by tradition, has been updated with set-in sleeves, saddle shoulders, and a more figure-flattering fit.